Rare pennies are easily split into two groups. Classic, spanning the years 1793 to 1954, and Modern, from 1955 to the present. Finding rare pennies in your box of old coins is... well, rare. However, don't let that stop you from looking. Twenty different dates spanning the Classic years are considered rare and valued accordingly. The total mintage of the top 20 rarest pennies is a surprising 5,720,028 coins. You are left to wonder, how many are still out there. Even more fascinating, the number of modern rarities, those minted since 1955, is unknown due to the fact most are minting errors. Determining the actual number of these is never more than an educated guess. 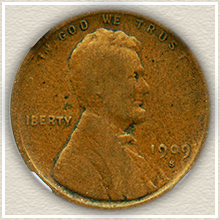 With 5,720,028 Classic rare pennies made, why are they rare and what are your chances of finding one? These are both good questions. Pennies are the staple of commerce and after decades of use, they simply wear out. Remember at the time no one knew these coins where rare. Many more suffered bad luck... lost, destroyed by fire, swept away by floods, not to mention buried in a jar in the yard and forgotten. 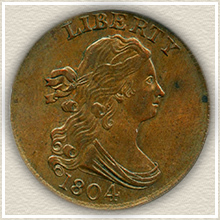 Then after 1857 the size of the penny was reduced to reflect the rising cost of copper. Mass melting of the older coins accrued, further destroying countless common and rare pennies. Add to all this the relative few coin collectors of the time saving coins for future generations. The result... rare pennies. Here are the Classic Top Twenty and their values. Note: The coin values listed are wholesale values for coins in "Good" condition. This represents a well-worn but undamaged, wholesome coin. Note: Values updated 2017. 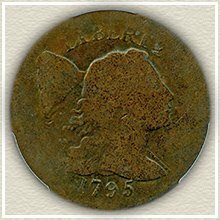 Very collectible and one of the earliest years, 1795 half cent valued at $520. Pleasing condition 1802 half cent, scarce and worth $915. 1857 Last year of the half cent, popular with collectors and awarded a solid minimum value of $52. A long obsolete denomination in US coins. Half cents were first minted beginning in 1793 and ending in 1857. Here are a few more of the standout dates. 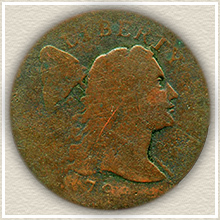 1793 worth $2,215 First year of issue half cent, a favorite with collectors and always in demand. 1794 $495 Scarce, low mintage, classic half cent. 1797 Few of these survive, and valued at $325 and easily higher. 1794 An early year of the US mint and artifact of Colonial America, at $525, seems reasonable. 1796 Features the earlier Liberty Cap design, a distinctive type coin and worth $425 each. 1804 $1700 Very nice examples of this date are known. Often these nice condition coins are collected as a representative of the large cent era. 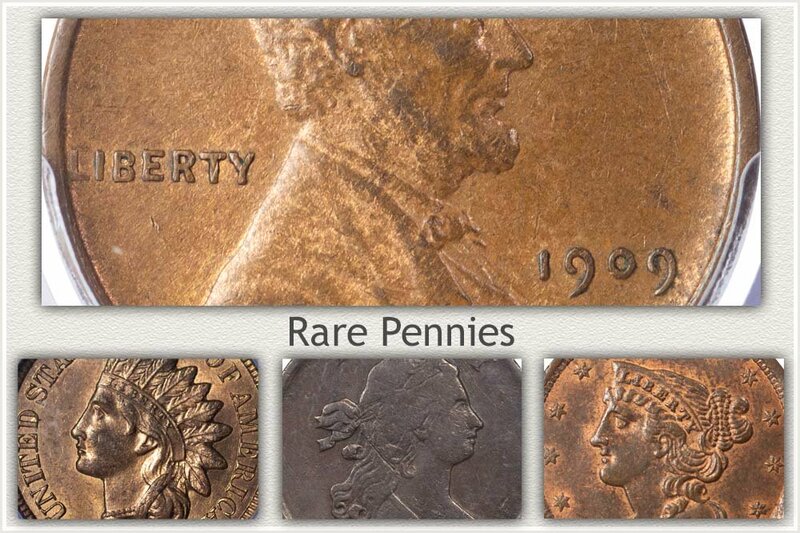 Large cents are a classic and historically significant part of the rare pennies listed here. These are the first US coins minted. Large in size, larger than today's quarter, and avidly collected. Minted from 1793 through 1857, all are desirable. Find one as nice as the 1804 pictured and you have an important coin. Here are a few more rare large cents. 1793 Chain Type $4,775 First US cent, first of three designs in 1793, very scarce. 1793 Wreath Type $1,716 Necessary to all important collections of large cents. 1793 Liberty Cap $2,200 A few thousand minted and only a small number remain. 1795 $430 minimum value. If hair detail is showing in Liberty's portrait value rise by hundreds of dollars. 1799 $3,500 and the key to the series, exact mintage unknown. Estimated less than 150 survive. 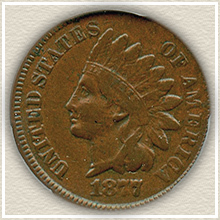 One of the intensely sought rare pennies of the series. 1877 $365 Very few survive, mostly found in heavily worn condition and relatively few of these exist. 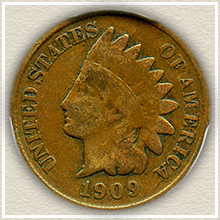 1909-S Indian cent $245 Notable as the last year for the Indian cent, low mintage total and its production at the San Francisco mint. 1909-S VDB Lincoln cent $365 One of the most popular of all coins. First year of the Lincoln cent and interesting placement of Victor D Brenner's (the designer) initials on reverse. Find any one of these in your group of old coins and you have discovered rare pennies but a valuable part of history. Despite the high odds against finding a rare classic. By knowing which are the truly rare coins, the odds are, one will never slip past you. 1914-D $52 Low mintage combined with few saved results in a scarce coin in any grade. 1922 No D $275 - exact mintage unknown. The "D" mintmark indicating the Denver mint is missing on some examples. Notable because the Philadelphia mint ( which did not use a mintmark) did not strike pennies in 1922. 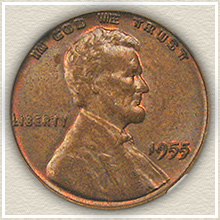 1955/55 Double Die Lincoln Cent: $1,400 Famous and Stunning, causing an real interest by collectors. 1972/72 Double Die Lincoln Cent: $300 Another of the mint made doubling of the obverse die that has caught on in popularity the hobby. 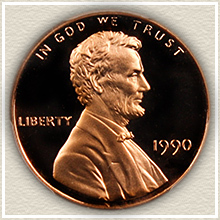 1990 No S Proof Lincoln Cent: $3,000 All modern proofs are struck at the San Fransico mint and a few are missing the "S" mintmark. Note: Only found in proof sets. Circulation strikes from the Philadelphia mint, no mintmark, are common. Following the Classics, we enter the Modern era, from 1955 to the present. 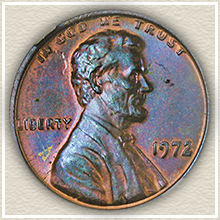 The majority of modern rare pennies are minting errors. They create lots of excitement as discovered. With some becoming favorites of collectors and maintaining their value and others fading from memory. In order to attract lots of attention and value the error must be striking in appearance. The spectacular 1955/55 Doubled-Die error is easily the most famous eye catching minting error. The above are the top celebrated coins, however numerous other minting errors with values ranging from a few dollars and up are in circulation today. Start by searching for information... "Strike it Rich with Pocket Change" by Ken Potter and Brian Allen is the latest book dealing with the subject. 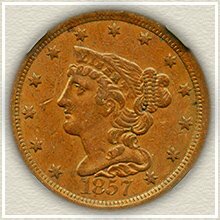 Additionally, many rare coin dealer's web sites list modern rare pennies in their price list. Searching is exciting when it leads to a "find" and it is always interesting. Your rare pennies can fascinate and thrill you and your family for a life time. Coin Collecting Guide for Beginners takes you on a journey through one of the oldest and most popular of all hobbies. Discover the best value of your coins. Discover your rare pennies and all old coin values. Half Cents, Large Cents, to Indian and Wheat pennies. 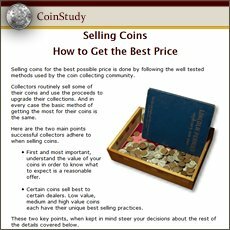 Match your coin to the value charts, staying current with how much they are worth today. Coin Values Discovery... finds the Value of Rare Pennies and... All old US coin values. It is an excellent index with images and text links to all coin series, from Cents to Gold. Value charts, grading images and descriptions uncover how much your box of old coins is worth.